In a report, the non-governmental organisation (NGO) says that Congo’s timber production worth $97 million does not comply with international timber trade laws. According to Jules Caron, campaigner, Congo Basin rainforest at Global Witness., illegal logging and the multi-billion dollar illicit timber trade threaten forest ecosystems. The report by the non-profit analysed the findings of independent inspections of 28 of Democratic Republic of Congo’s (DRC) 57 industrial logging concessions from 2011 to 2014. The inspections revealed illegal activities such as logging outside permitted areas, overexploitation and falsification of records. The Congo basin, which covers an area of 500 million hectares, boasts of the world’s second-largest tropical forests. According to the World Wildlife Fund (WWF), the Congo Basin spans across Cameroon, Central African Republic, DRC, Republic of the Congo, Equatorial Guinea and Gabon. There are approximately 10,000 species of tropical plants in the Congo Basin and 30 per cent are unique to the region. Investigation by Global Witness has revealed that timber companies are defying forest protection laws and underpaying taxes to plunder the rainforests. Reports by the INTERPOL and the United Nations Environment Programme (UNEP) show that around 30 per cent of yearly timber production as well as 50-90 per cent of timber extracted from tropical countries is illegal, creating a $30-100 billion global trade, Caron told Down To Earth. “Massive financial flows generated by these criminal activities have also exacerbated armed conflicts in countries like Sierra Leone, Liberia, Cambodia and Myanmar,” he said. There have been a number of conflicts between local communities and logging companies as a result of illegal timber trade. In several areas, local communities feel that logging companies have broken their promises to build schools and set up development projects. On numerous occasions after logging companies called in security forces to deal with protests, community members have been allegedly beaten up or raped, Caron added. “We knew that DRC logging companies were breaking the law, but the extent of illegality is truly shocking,” Alexandra Pardal, Global Witness campaign leader, said. The report says that logging companies SIFORCO and SODEFOR, a subsidiary of Nordsudtimber in Liechtenstein, are the worst offenders. Even independent campaign organisation, Greenpeace, had earlier reported that SIFORCO was involved in human rights violation in the Congo area. However, according to media reports, SODEFOR has denied the charges and SIFORCO has not responded to queries. Global Witness has called on the European Union (EU) and the United States law enforcement authorities to crack down on timber companies. France and Portugal are the biggest recipients of DRC timber globally after China. Under the EU’s Timber Regulation, companies are prohibited from importing timber that breaks the laws of the producer country. In the US such violations are considered a criminal offence, the Global Witness report adds. Sanctions in the EU differ country-wise, but in France a violation is punishable with both fine and two years’ imprisonment. EU companies are also obliged to carry out checks on their supply and screen products to check illegality. 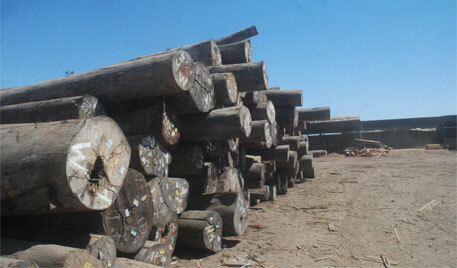 However, European and US companies are buying DRC timber and fuelling the illicit logging trade. They purchased over $20 million worth of DRC timber last year, Caron told Down To Earth. For decades, forested areas like the Asia-Pacific region, have been pillaged for valuable timber to supply the consumer markets of US, China, Japan and EU, he added.